From the 18th century onwards, the concept of the genius and a preference for the « autonomous » art work led to a separation of the so-called fine arts (painting, sculpture, and architecture) from the applied, decorative or minor arts (gold- and silversmiths’ work, ivories, ceramics, furniture, textiles). 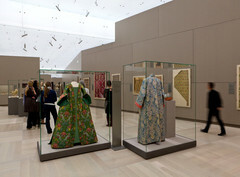 The distinction gravely affected the choice of subjects and themes for art-historical research, and crafted objects continue to receive only marginal attention in academic art history, although they were held in high esteem by contemporary patrons, often commanded extremely high prices and played important roles in the representation of both the nobility and wealthy citizens. The term « treasure art » not only reflects the material value and the extraordinary skills, even virtuosity, manifest in these objects; they often were of particular importance in situations that recent historical research has addressed with a view to symbolical communication and to aspects of performance/performativity. Studies that take the situative and performative contexts into account for which these objects were intended and in which they took effect, have therefore achieved more differentiated evaluations. In recent years, aspects of material culture and materiality have been considered or reconsidered in many disciplines of the humanities; art history in particular has re-established its competence in the study of objects. Analyses of the material qualities of art works, their effects and functions, of specific techniques, the organization of processes and workshop practices substantiate this renewed interest. Founded in 2009, the Abegg-Stiftung’s Chair for the History of Textile Arts (Prof. Dr. Birgitt Borkopp-Restle) aims at establishing and encouraging an academic discourse on the applied arts from the early middle ages to the present. Material and technical aspects of the applied arts as well as their specific uses, functions and meanings in artistic, historical and political contexts are at the core of the department’s research and teaching. We explicitly seek to contribute to current interdisciplinary discourses on material culture and cultural transfer in the humanities, to studies on the history and practice of collecting and presenting art works, on concepts of space and performativity. The Bern Research Camp for the Applied Arts, held annually since 2010, invites young scholars whose MA and PhD projects focus on object-based research in the applied arts. The workshop offers them a unique opportunity to present current projects to an audience of young scholars, academics and curators. We propose intensive discussions both of individual projects and of overarching questions and methodological approaches relevant for our themes, and actively encourage networking among the participants and with experienced scholars in the field. The program of presentations and discussions will be complemented by a visit to the Abegg-Stiftung, Riggisberg. Please send us your proposal for a 30-minute presentation containing a description of your project and your methodological approach (not exceeding 300 words) and a short CV as a pdf-file until 28 February 2019. Funding will be provided for the participants’ accommodation in Bern; if possible, we will also contribute to your travelling costs.